The 10-mile South Bay Expressway takes you to the places you want to go. Beginning at SR-905 in Otay Mesa, the Expressway provides fast and convenient access to and from Mexico and communities across San Diego County. Whether you’re commuting to work or school, traveling to Mexico or driving to South Bay shopping and entertainment centers, South Bay Expressway takes you there! 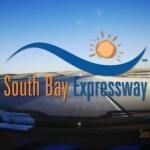 WELCOME TO SOUTH BAY EXPRESSWAY from Love Machine Films on Vimeo.